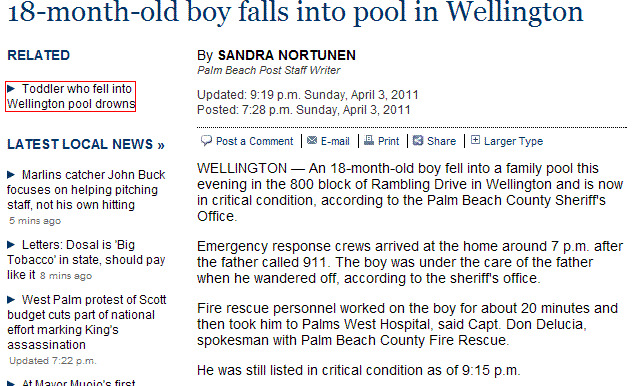 A sad news from The Palm Beach Post headlined Sunday evening about a toddler who accidentally fell into the pool. The boy was taken to Palms West Hospital in Loxahatchee, said Capt. Don DeLucia, spokesman with Palm Beach County Fire Rescue. He was listed in critical condition at 2 hours after the accident but was reported that he passed away Monday morning. Authorities have not released the name of the father or the toddler but some suggests that the father should be charged because of the accident. 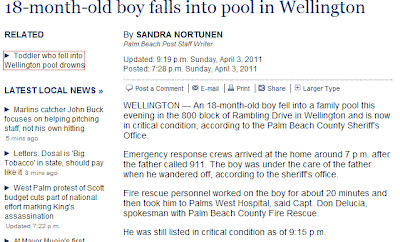 This kind of news is not new and there are unrecorded pool accidents out there reminding us that swimming pools are "not exactly" for children. There's a lot of circumstances that triggered the drowning to happen and I'm sure there's a lot of speculations but we are not certain if the father should be sued or not. I hope this pool accident would urge the parents to install safety equipment around their swimming pool to prevent the sudden loss of young lives.